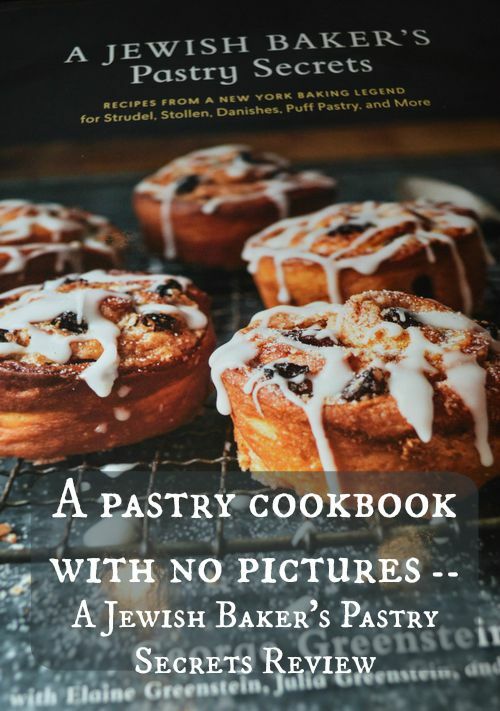 A Jewish Baker’s Pastry Secrets, recipes from a New York baking legend for strudel, stolen, danishes, puff pastry, and more. George Greenstein. 10 Speed Press: Berkley, 2015. I was thoroughly excited to find A Jewish Baker’s Pastry Secrets. The author, Mr. Greenstein was a pastry baker, the son of a baker, who owned a bakery in New York City. Mr. Greenstein began writing this cookbook 12 years before he passed away in 2012, at 83 years. This cookbook was compiled by Mr. Greenstein’s children to honor his memory. I really wanted to like the book. It is hardcover, and I anticipated that it would make a nice gift book for my friends, who like to bake. And it talks about secrets. Who doesn’t want to find out the trade secrets of a successful pastry baker? The baker’s secrets come in little boxes sprinkled through out the text. For instance, the recipe for Cinnamon Babka Loaf, page 70-71, says, “Before baking, some bakers like to drizzle additional streusel over the top…Spread gently, to avoid causing the dough to collapse.” Reading these “secrets”, more like tips, you can imagine Mr. Greenstein speaking to you, as he watches you make each recipes. The recipes themselves are interesting with many variations on flour, water, butter, and salt. There are just 8 main recipes that make use of 14 basic fillings and 5 glazes, with several variants, giving the book actually more than 100 dessert recipes. Unfortunately, there are no pictures. Even the cover photos have no description. The uninitiated are at a loss to understand how to assemble the recipes or even what they should look like when baked. This seems especially important when working with an unfamiliar recipe, like Gugelhopf with walnut filling, on page 114 or the Bee Sting coffee cake on page 50. For those who are following the trendy gluten-free diet or a vegetarian diet, this book isn’t for you. Wheat flour, butter, full fat cream, and fresh eggs feature strongly in the recipes. Those new to scratch cooking may find the directions confusing. There is no glossary to explain the various terms used. The writing assumes some mastery from the reader, already. However, those who are already familiar with the special techniques of the French pastry chef, will find a few new recipes to try in this book. I had to look the recipes up online to find out what the basic dough normally looked like when baked so that I could decide if I wanted to try the recipe. With pictures and a glossary I would have given the book 5 stars. The writing is well done. The layout is logical and easy to navigate. Mr. Greenstein seems like a personable character that would be nice to have in your neighborhood. But as a cookbook, it is seriously lacking in usefulness for all but the experienced pastry baker. If you are an experienced baker this book has a lot to offer. And you will enjoy it for the stories, and the exceptional recipes. But if you are new to scratch baking or just getting started in pastry techniques, you’ll want this book for your second choice. Pick a cookbook with lots of good step by step pictorial instructions for your first choice. A Jewish Baker’s Pastry Secrets. I received this book from Blogging for Books for this review. This review represents my honest opinion of the book.